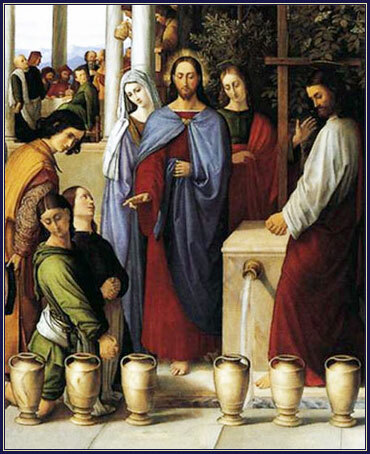 On the third day there was a wedding at Cana in Galilee, and the mother of Jesus was there. Jesus also was invited to the wedding with his disciples. When the wine ran out, the mother of Jesus said to him, "They have no wine." The meaning of the famous line, "My hour (or my time) has not yet come", is well-understood. Implicit in Mary's statement, that the wine has run out, is a request or suggestion that Jesus do something about it. But he seems to refuse. The time for his glory -- his becoming known as the son of God to the general public, and the tumultuous events leading to his crucifixion -- has not arrived. It is too early for him to be working public miracles. But we know he is about to turn jugs of water into wine; how can this be reconciled with his statement, that his hour has not yet come? We learn that he isn't refusing to help out the wedding party; he just wants to keep it quiet. As we will see tomorrow, Jesus will involve only a couple of servants. The wedding guests and even the caterer and bridegroom are kept in the dark.